Why don't you move the hell to Iran and see if you can get a Lamborghini? You can't even get one here. In the U.S. tens of thousands of lamborghinis are imported each year, purchased by people who are using honestly gained funds. In Iran, a few corrupt parents use stolen money to buy their bachehs one or two lamborghinis in the whole capital city. Mark is truly a despicably dishonest person for linking to these things. Let me guess...are those 'parents' 1st degree Hajis in authorative positions? Reminds me a lot of Saddam and his sons, Uday and Qusay. 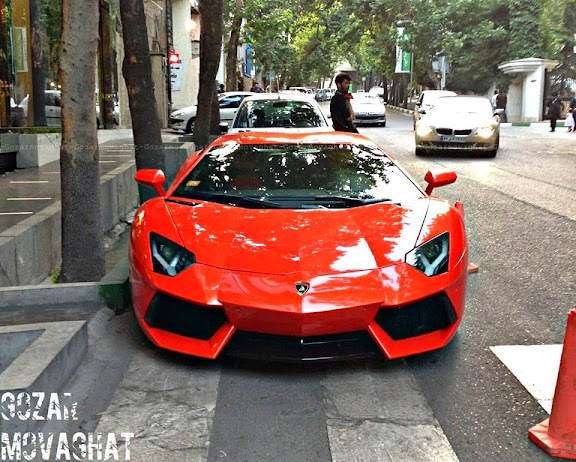 I agree with Anon 3:44 PM, these cars belong to Batche Akhoonds spoiled little brats (and there are many of them in Iran as well as in London and Orange County). And they make their money in non-value adding ways. For example, they might make money by having access to a special permit to import goods, or special subsidized dollar exchange rates -- or other sorts of economic theft that do not exist in the United States. Anon 3:44PM, jealousy is a deeply unattractive trait. No one is jealous of anyone living in Iran. That's why even you, an Iranian, live in the West, under a superior people and culture. "No one is jealous"!? Lol, yeah right. Did you remember to salute with your right arm, when you wrote that? What is wrong with your mind that you live in the west, your greatest fear is losing that right and being deported to iran (where like the vast majority of iranians you'll live a life of fear and misery under a disgusting mafia like regime) -- yet at the same time you praise iran and accuse other westerners of being jealous of life in iran? That's so dishonest it is akin to mental illness. This trait of dishonesty is prevalent in iranian culture more than any other culture I've seen. Iranians simply do not have any hesitation when stating flat out bald face lies. That really is the iranian dna. With that, Anon 9:48 AM, you have shown the true face of anti-Iran people, to the world. Nothing more than old fashioned racists. Thanks. I agree Anon 4:46 PM. The Akhoonds make the "laws" in Iran to suit their theiving habits.Put it this way,if the Akhoonds went on strike tomorrow there will be no loss to the country.But if the sewer workers went on strike all hell will break loose.That is what a Akhoond is worth.Nothing but a parasite. Anti-Iran people need not be jealous of others who have wealth. If people have more money than you, it is a waste of time to be envious of them. It will not benefit you, only bring you down. It is far more beneficial to appreciate what you do have and try to improve your own lives, instead. It is not a question of being "Anti-Iran" or being "jealous".It is a question on how these people make one law for themselves and another law for others to obtain vast amounts of wealth while the country is bankrupt and in poverty. The thieves are in charge. Yes its called capitalism,and like a lot of systems there are winners and loosers,How much do you think the pahlavis stole and squandered?